Dabawenyos are probably the most stubborn adjusting to new names of any street. I still call Bonifacio as Cortes, not the former. Bonifacio belonged to the other side of Claveria (sorry, should be C.M. Recto). Pardon my ignorance, but I do not who the person is. Can somebody enlighten us who he or she was? Okay, just did a reading Hernan Cortes was the conqueror of the Aztec empire, not sure how his name ended up as a street in Davao. Maybe vestiges of our Spanish past. Claveria was the governer general who ordered the distribution the catalogue of Spanish surnames to replace our local surnames. Claveria the street found it deeply rooted in any Dabawenyo’s brain to be replaced by a nationalist Filipino, Claro M. Recto. Uyanguren still is Uyanguren, despite the maps saying Ramon Magsaysay Ave. Magallanes despite it is Pichon now. Times have moved on, but Dabawenyos are still stuck in the past in calling their streets. While we have our Spanish past, don’t leave the Americans out, we still call Carpenter instead of Leon Garcia. Have they renamed Bolton? If you go to Toril, wondering who Macleod (with people pronouncing it as ma-kle-yod instead of the Scottish ma-klawd) is? Our very own Quezon Boulevard is just called lazily and I would understand Boulevard, but a lot call it as Trading. Not sure if a portion of Boulevard refers to as Trading or the whole stretch of it. Somebody was asking of it, I can only guess it was a trading output during th early part of 1900s. 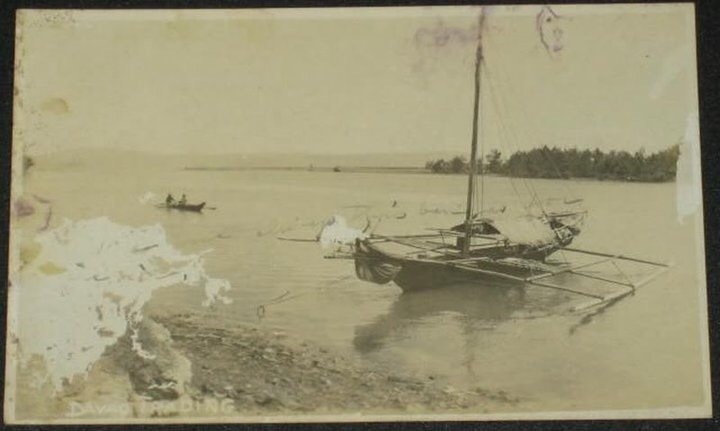 One of the earliest ebayfind I had when I started scouring the net for old Davao images. But some were also left and forgotten in the past, like the photo in the top, not many remember Jones Circle, where Claveria (see, even me), Uyanguren, Hospital Ave, Jacinto converge. Oddest street is Ponciano Reyes, whereas others are called by the last or family name, this one is by the first name, so to to this day, people still call it Ponciano, not Reyes, but just Ponciano. Weirdest maybe shortest, the Crooked Road. And for the how many streets of Davao that has been renamed, taga Davao ka if you refer to a lot of streets in its old name. And I wouldn’t hate you if you still call it by its old name. Haha. Maybe it’s just the way a Dabawenyos’s brain is wired. Just longing for that gentler and innocent time. No disrespect to the movers and shakers whose names are now gracing these streets though. Hopefully the next generation will call them with it’s rightful names.